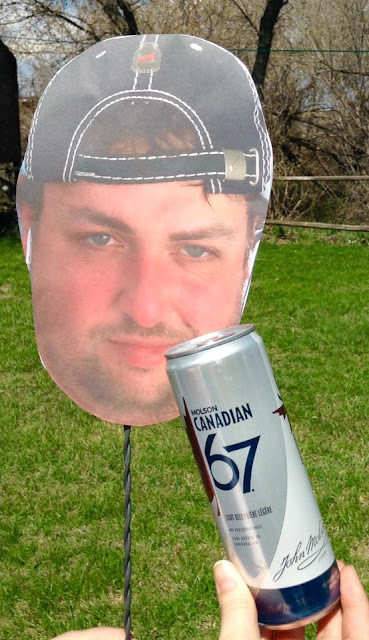 I had the pleasure of meeting Stephen, or better known on Twitter as PaddockWoodGuy, he's currently doing a Canada-wide road trip with his family and trying to meet as many beer geeks as he possibly can! I seriously suggest you to give him a shoutout if he's in your neck of the woods, his love of beer is full of passion, in fact - probably even more passionate about it than I am! 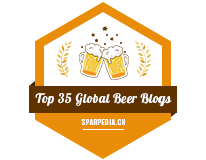 Hi all, Paddock Wood Guy here, it's my pleasure to be a guest on the Cranky Beer Blog. Cody was my gracious host on Canada Day in Brandon, MB. Mrs. Paddock Wood Guy, the two halfpints, and I are embarked on a cross Canada trip, visiting craft beer fans where possible, trading a bottle or two of Paddock Wood goodness for a bottle of your favorite locally available beer. Brandon was our first beer trading stop and we met Cody, who I knew only as @cdnbeer on Twitter, in a lovely city park, at a shady table where we shared a fried chicken picnic lunch and an Alley Kat Saison from Alberta and a Kona Coffee Imperial Stout from Fort Garry in a meeting of the provinces. It is so satisfying to connect with fellow beer fans in person! Cody then took me to the Liquor Mart on Victoria and 10th, where he cheerfully emptied my wallet with suggestions of great craft beer for my trip across Canada (shameless plug: follow me @paddockwoodguy on Twitter, #pwguyroadtrip all the way to Labrador and back). We made a C-note look silly, and loaded a basket with tasty beer. I'm a big fan of drinking local beer in locale, but I've found that most small town liquor outlets don't do a very good job of carrying their own province's craft brew. A side note of appreciation here for the grocery store Val Marie, SK, which carried the Big Box o' Beer from Paddock Wood. A far more usual situation prevailed in Oxbow, SK, where the only craft-y option was Dead Frog, from BC. So when I had the opportunity to load up on both Manitoba and Ontario craft beers in Brandon, I leaped at the chance. And sure enough, no further craft beer presented itself all the way to Sleeping Giant, although to be fair, with a cooler full of tastiness, I didn't look too hard. The Paddock Wood Guy clan paused on our cross Canada journey for a couple nights near the shores of Lake Superior on an isolated loop of Mary Louise Lake Campground in Sleeping Giant Provincial Park. In stark contrast to the generator and radio infested campgrounds we often encounter, the loudest things on this lake are the loons, raising the alarm when the eagles visit to raid the fish. After a 20 minute drive in from the highway, there is a further 20 minute drive from the main campground to the distant loop across the lake. No services, no water stand, no 40 foot trailers. Just us, the lake, the sun and the moon. In a word, paradise. But also more than two hours from any hope of craft beer. So I was deeply thankful to Cody and to the manager of the Brandon Liquor Mart for making possible my cooler full of Manitoba and Ontario craft brew. The weather obliged with two nights and a day of scorching 30 C weather and satisfyingly dramatic and cool nighttime thunderstorms. Much maltier than expected in an IPA. Big bitterness cushioned by massive deep malt. A good compromise if you are a fan of big malt (as I am) and are looking for a maltier hot day IPA, or a more bitter winter warmer. A perfect brew for cool evening by the campfire after a hot summer day. Classic example of American IPA done west coast style. Powerful centennial aroma, grapefruit essence, aggressively bitter. Yum on a 30 C day at Sleeping Giant. I wish I had more of this one, although I typically prefer a British style IPA. Muskoka has managed to load huge amounts of hop flavour and bitterness, while avoiding the harshness that so many west coast hop monsters fall into. A contender for the place that Sierra Nevada Torpedo has in my heart. And it's Canadian! Well done, Muskoka, I wish I could get this in Red Deer, AB. Pothole Porter by Half Pints Brewery, MB. Alas, this should have been saved for aging. Best enjoyed by a fire on a cold midwinter's eve, but brought to me by my own halfpint, while I was sitting in a lawn chair, hip deep in Marie Louise Lake, in Sleeping Giant Provincial Park, near Thunder Bay, ON. I didn't have the heart to send him back for a pale ale or IPA. Ok, truthfully I already had the cap off before I realized my mistake. This beer is a mouthful: slightly syrupy and thick, but not unpleasantly so, the roasty tarry goodness coats the palate and throat, incredibly rich and a tad sweet, before the perfectly balanced hops scrub the palate clean, ready for the next swig. I regret opening this on a 30 C day, although I had no problems finishing it. I'll be looking for a bottle or three to pick up when I pass through Manitoba on the return trip. This is tasty, if a bit syrupy, stuff. True confession time: I rarely have a beer session in which I don't also indulge in a beer or more from my favorite brewery, Paddock Wood. This was no exception, as one lone Czech Mate Pilsener had escaped my earlier cooler predations en route from Alberta, and served as a good palate cleanser and refresher after the chewy porter. I enjoyed the scrubbing of the massive load of noble hops on my palate, which set me up nicely for the next series of ales. From Barrie, ON, Flying Monkeys with a tasty trio: Hoptical Illusion Almost Pale Ale, Netherworld Cascadian Dark Ale, and Smashbomb Atomic IPA. Although I was too wary to ask the kid to fetch another beer after the huge bottle of of inappropriate although delicious porter I had to choke down (rough life, I know) nothing but chance was behind the perfect order that I pulled these from the watery ice at the bottom of the sweating cooler on the shore of Mary Louise Lake, Sleeping Giant Provincial Park, on Lake Superior, Ontario. Hoptical Illusion is a true class act, an almost perfect beer. I could drink this all day, although the hops are a little much for the malt backbone of a pale ale. My favorite of the trio, Netherworld, is a wonderful, if unusual, concoction that many breweries are playing with these days: a dark IPA, although Flying Monkeys labels it a Cascadian. It's a satisfying and balanced blend of bitterness and classic west coast (ie Cascade and cascade-like) hops and just the right amount of roastiness. Although roast malts aren't usually my choice for a hot day refresher, they work well in this beer. I could use a case of these. The final entry in the trio, Smashbomb Atomic IPA is a real explosion of Citra hops. Flavorful and juicy. I'm a sucker for Citra, And I love this more than I usually like west coast hop bombs, and all the credit goes to Citra blend hops. Grapefruit and orange and a bit of Juicy Fruit. Yummy. But at the end of the day, as I watch the sun set over the lake, fending off the last of the biting flies, and the first wave of the night shift's mosquitos, finishing off the last deliciously citrusy mouthfuls of Smashbomb, what I really want is another Netherworld Cascadian Dark Ale.